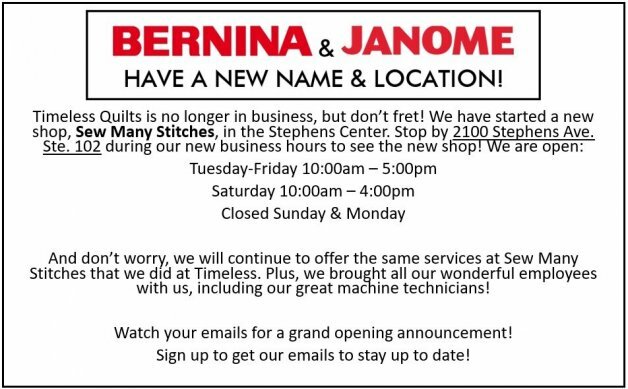 We are the JANOME and BERNINA dealer of Missoula, MT. Contact us today with any questions you may have at (406)-542-6566. We look forward to hearing from you. Visit our Embroidery Design Studio store by clicking the image! 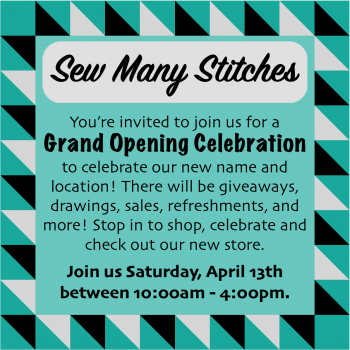 Formally known as Timeless Sewing Center, we are excited to continue serving the area at our new shop, Sew Many Stitches. At Sew Many Stitches, we are committed to providing the Missoula, Montana, sewing community with a wide variety of products to help customers achieve their creative goals. In addition to high quality, 100% cotton fabrics, threads, notions, books and patterns, we specialize in the sales and service of BERNINA and JANOME sewing, embroidery and serger machines, offering on-site repair services by certified technicians. We also provide a fun lineup of classes in subjects that appeal to sewers and quilters of all styles and skill levels. From fabric and notions, to sewing machines and friendly service…we’re your one-stop sewing solution!